UK-based company Vitality announces its partnership with Amazon Prime in a new hilarious ad. 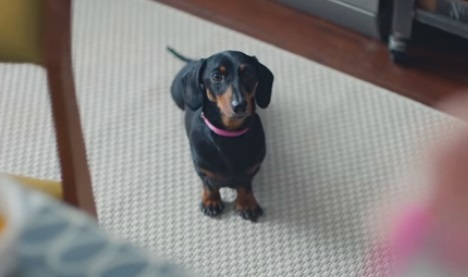 The 30-second spot opens with the company’s dog mascot, Stanley the Dachshund, enjoying a rainy day inside and thinking, from the comfort of his home, that his human friend will never take him for a walk in that rain. His luck is about to change as an Amazon Prime deliveryman shows up at their door and hands a package which it turns out contains a rain jacket for him. “You have got to be joking!” Standley’s thought is upon seeing his new wardrobe item. Now properly equipped for the weather, he is heading out together with his owner, who’s so determined to stay fit that she goes out for a run even in the rain. “She wasn’t joking,” Stanley reveals, while keeping up with her in the park. “Sign up to Vitality Health or Life Insurance and you can get Amazon Prime on us, with fast delivery, movies, music and more, when you stay active,” the voiceover says at the end of the advert, adding the company’s tagline,”Vitality – Positively Different.” Stanley also has something to add hearing this tagline, stating that “this is positively awful”. Vitality offers a range of health, protection and investment options to suit your needs, discounts and rewards when you get active and track your activity, meaning you can benefit without having to claim, and a member programme called “Vitality VIP,” which allows you to watch sporting partners in action and win money-can’t-buy experiences with Great British Chefs and Disney. The annual Prime membership that you could win is worth £79. However, minimum monthly premiums and terms and conditions apply, so you are advised to visit the company’s website for more information. Prime is an annual membership that lets you send, stream, shop, read and more. Among other benefits of Amazon Prime are unlimited streaming of thousands of films and TV shows with Prime Video, unlimited access to a growing selection of over 2 million songs with Prime Music, early access to Lightning Deals on Amazon.co.uk with Prime Early Access, secure unlimited photo storage with Prime Photos, unlimited reading on any device including thousands of books, magazines and more with Prime Reading, the ability to share selected Prime benefits with other members of the household with Amazon Household, as well as fast delivery on millions of items. Another recent Vitality advert features, besides Stanley the Dachshund, Vitality Ambassadors Jonny Wilkinson, Jessica Ennis-Hill, and Sebastian Coe.